It's 4:45 in the morning and it's been raining, pouring, really, all. night. long. In fact, it's been raining pretty nonstop for weeks and months. I'm pretty sure the sky forgot how to stop. The birds are chirping and singing like crazy. Their sweet tweeting, mixed with the rain-sound, is soothing and lovely. I have an idea. or maybe i should say an idea has me. I woke up at 4:00 a.m with it and it wouldn't let me go back to sleep. I rolled over a few times, pulled the covers up a little higher, tried to let the rain soothe me back to sleep. But, instead, my heart started beating a little faster, i couldn't lie still, and, after a few dozen breaths, i found my body practical leaping out of bed. So, because today just happens to be Friday, and because i'm feeling like feeling the fear and doing it anyway, and because i know each step leads to the next and the next, and because i know i don't have to know the "hows" ahead of time, and am trusting that that part will take care of itself, and because i know the power of creating out loud--today, i will begin. This is my baby step. Every Friday (or sometime during the week) i will, consciously and with intention, do something that scares me/challenges me/takes me out of my comfort zone. It can be something tiny or big. Something i've been afraid of forever and have put off doing. It can be as simple as making contact with someone i haven't made contact with for a while (due to some small or big fear). Or saying i'm sorry. Or, i love you. It can be taking a tiny little baby step in the direction of what moves/inspires/excites me. Or pausing long enough to hear those whispers that i've been pretending i don't hear. Or slowing down long enough to meditate. Or stepping out the door for a run. It could be quieting my voice and listening instead. It could be posting or submitting that painting or photograph or poem (or comment!) :) that's collecting dust, even if i don't think it's "good." Or writing or speaking those words that are whispering or screaming to be heard. It can be doing something completely out of the ordinary, something out of my comfort zone, just to stir & rattle & shake things up a bit. And i'll come here, to this space, and tell you about it. And write about it in the comment section. In writing about it, you claim it & celebrate it & release it & strengthen your courage & resolve. And in doing all of that, you help others to claim & celebrate & release & strengthen their courage & resolve. And beautiful lovely things begin to happen. It would be so much fun to let our lights shine together. To be liberated from our fear. What would i do if i couldn't screw up? What would i do if i/it didn't have to be good? What would i do if i weren't worried about what others would think? What would i do if i were not trying to impress anybody with the result? What would i do if i didn't have to know what comes next? What would i do if i were not afraid to be free? What would i do if i couldn't fail? *I'm sure, as i begin this, that there will be reasons i can't always post on Friday (sick kids, travel, unexpected somethings) but i'm going to be soft and compassionate with myself and do the best i can to show up for me. And for you. In my experience,giving myself permission to shine is far easier than allowing myself to be paralysed by fear. Sometimes, I forget and then I remember, and the world becomes a much friendlier place to live. A Course in Miracles says that the only thing missing in any situation is what we are not giving it. I agree with it's teachings wholeheartedly. let love light the way. We are making the journey home .. together. Hi Julia, I found your blog through flying lessons but have been behind on introducing myself. 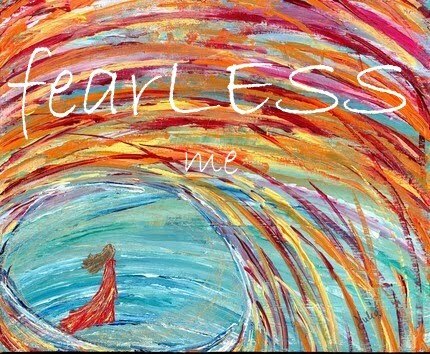 I really enjoy your work and I love this Fearless Friday idea. It does feel amazing to do the things that scare us, thanks for the inspiration! Love this idea and I have decided to start dancing and running again because this is what helps me to leave less room for fear (and I have recently written about it my blog). Very cool. You are doing it Julia.